Trump Insists Collusion Is Not A Crime - Wisdom is the retention of innocence through adversity. Is There Irrefutable Evidence of the Trump Campaign's Collusion with Russia? Russian President Vladimir Putin has invited President Trump to Moscow just days after the White House postponed a planned meeting between the two leaders in Washington until after the midterm elections. The invitation to Moscow comes after Trump and Putin met for a summit in Helsinki, Finland, earlier this month. 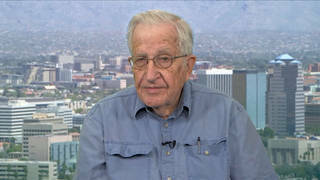 For more about U.S.-Russian relations, we speak with world-renowned political dissident, author, and linguist Noam Chomsky. He is a laureate professor in the Department of Linguistics at the University of Arizona and Professor Emeritus at Massachusetts Institute of Technology, where he taught for more than 50 years.